Cherry Eye in Dogs, medically known as the prolapse or eversion of the gland of the Nictitating Membrane (Third Eyelid), is a condition in which the gland of the lower eyelid bulges out and appears as a bright reddish mass in the lower corner of the eyes. 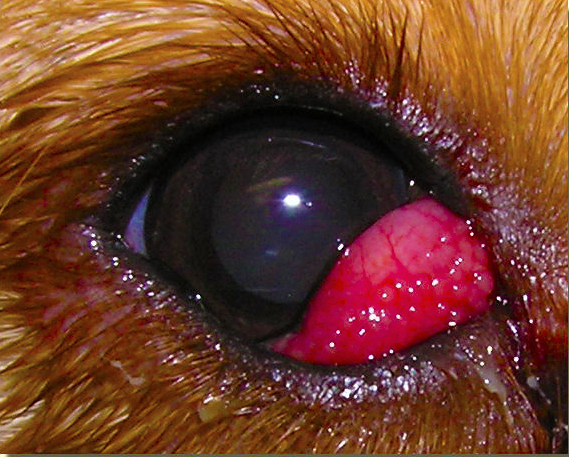 Just because of this reddish mass bulging out from the eye, the disease is also known as “Cherry Eye Disease”. The exact cause and causative agent of Cherry Eye Disease is still known. But it’s hereditary and genetics probably play a large role. While cherry eye can affect one or both eyes, mostly it doesn’t happen in both at the same time. Affected dogs are uncomfortable from eye dryness, swelling, irritation, inflammation and pain. They rub their faces on flooring or furniture to try and relieve discomfort. But this disease can be treated easily and prognosis is always positive. Anatomically, each eye of domestic dogs contains a nictitating membrane – also known as a “third eyelid” – which hides beneath the lower eyelid and normally is not visible. Tear glands are located around the cartilage connections of the nictitating membranes and provide a major source of tear film and eye lubrication. 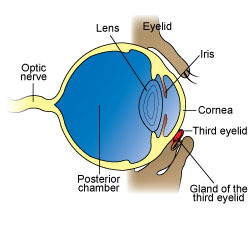 However, if the fibrous tissues that hold the third eyelids to the globes of the eyes sometime become weakened, the tear glands can bulge out (“prolapse”) over or around the third eyelid, appearing as dangerous-looking bright red masses. Cherry eye can occur in just one of a dog’s eyes (unilaterally) or sometimes in both eyes (bilaterally). Dogs that develop cherry eye usually show symptoms of ocular irritation, dryness, redness (conjunctivitis), swelling, inflammation and pain. The vision of dogs with cherry eye may be adversely affected as well, especially if the surface of the affected eyes becomes scratched, infected or abraded with rough surface rubbing. Cherry Eye Disease don not develop or start progressively. It appear like a sudden abnormality. And owner will observe a continuously protruding red mass in the lower corner of eye all of a sudden. The most obvious sign of cherry eye is a well-defined solitary mass of red tissue bulging from the inner corner of one or both of a dog’s eyes. Often, this protrusion is the only observable sign that owners see. Other signs of eye irritation. Cheery Eye diagnosis is not so difficult for a veterinarian. 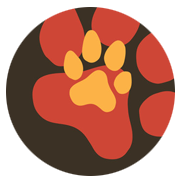 Your veterinarian will detect in the very first look at bulging red mass. Although some veterinarian suggest for some biopsy examinations in old dogs because they may develop this condition due to some carcinomas. 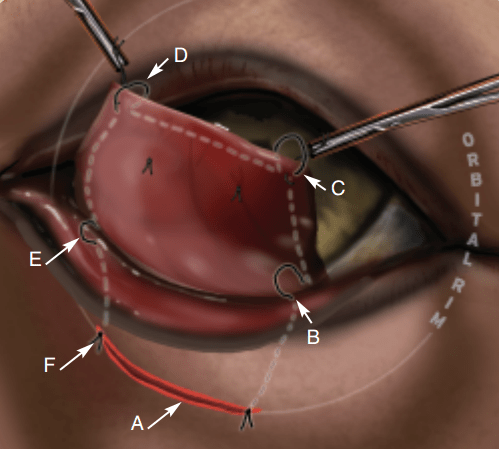 Two type of option are available for the surgical treatment of Cherry eye Disease. Re-positioning of the gland to its normal position is the best choice. Veterinarian use different surgical techniques and the bulging part is sutured back to its normal position. This approach save the tear gland and the eyes don’t become dry. Removal of the gland may cause more problems e.g. drying of the eye and that further need medicinal treatment. The precise cause of cherry eye is unknown. However, because it appears more often in certain breeds, it is thought to have a genetic component involving weak connective tissue around the third eyelid. Inflammation and hypertrophy seem to play a role as well.